“If” “When” & “How” for Chlorine users. Total Chlorine No adjustment required. If total chlorine is high but free chlorine is low, it is an indication that the hot tub requires a shock treatment. This can be done by adding your weekly dose of CareFree or Mineraluxe Oxygen. Free Chlorine Add 2 tsp CareFree Boost, Lithchlor, or Clean & Clear every 20 mins until desired result is achieved. If a disc floater is in: remove it from the tub until levels come back into range. If a floater is not being used: open the cover and let the jets run for 20-40 mins. If levels are extremely high you will see a brown ring around the Total Chlorine reading. In this case it is best to use Beachcomber’s Neutr-All to drop levels more quickly. 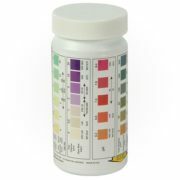 pH Always adjust alkalinity first. If pH is still low add 1 tbsp pH+ every 20 mins until desired result is achieved. Always adjust alkalinity first. If pH is still high add 1 tbsp pH- every 20 mins until desired result is achieved. Alkalinity Add 1/4 cup of Resist. Check level after 20 mins, if still low add 2 tbsp every 20 mins until desired result is achieved. Add 1 tbsp pH- every 20 mins until desired level is achieved. If extremely high due to using well or dugout water: bring in a sample to your water care specialist at the store and get a custom solution for dropping the levels faster using Acid Enhance. For most accurate measurements, bring in your sample to Beachcomber Hot Tubs, Pool & Patio for a custom computer analysis and treatment guide.